Yes actually I posted it precisely because of the cloud background!! I find the photo extraordinary for the cloud formation/colors! This was definitely the lull before the storm, as I saw what happened later on TV. It was not pretty. In any case, the police may be very interested in your picture. I certainly am, but for different reasons. I have seen many of the matches. Been fun seeing Zlatan perform. Sadly for the club he will probably head back to Italy now. And they look so well-behaved in your (very cool) picture. I guess they put their phones away and got down to serious hooliganism later. Actually they are currently watching the riots on the bridge by the Eiffel Tower! 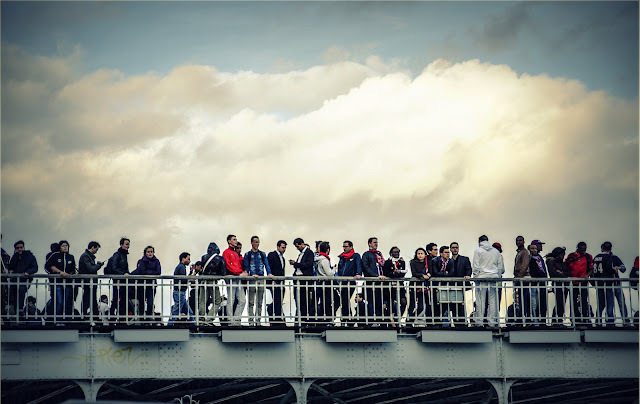 Fascinating photos of the soccer "mob" and the foreboding clouds in the background. Glad you left before things became too "hot"! It IS an extraordinary photo. That cloud is like a painting! Fantastic!